There are currently many chronic obstructive pulmonary disease clinical trials being conducted. Some focus on testing new medications while others look at better diagnosis, management and prevention methods. Others focus on preventing and treating flare-ups that are specific incidences where symptoms intensify. Chronic obstructive pulmonary disease clinical research sometimes studies ways to slow or even reverse progress of the disease. If you have been diagnosed with chronic obstructive pulmonary disease and are interested in taking part in a clinical trial, please review the list of current trials being conducted. Chronic obstructive pulmonary disease (COPD) is chronic bronchitis combined with emphysema. It is a condition that causes the airways in the lungs to narrow. The main symptom is shortness of breath and the main cause is smoking. Chronic obstructive pulmonary disease is a difficult condition to reverse and the symptoms tend to get worse over time. Sufferers often cough up sputum and eventually there is damage to the tissues of the lung. 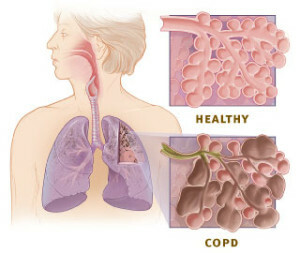 The symptoms usually point to chronic obstructive pulmonary disease, but lung function tests are needed for diagnosis. Chronic obstructive pulmonary disease is also known as chronic obstructive lung disease (COLD), chronic obstructive airway disease (COAD), and chronic airflow limitation (CAL). Chronic obstructive pulmonary disease treatments include quitting smoking, vaccines and drug therapies. Smoking is not the sole cause of obstructive pulmonary disease. Sometimes it is due occupational hazards where a person is inhaling harmful dust on a frequent basis. In these cases they can work to control and limit the amount of dust they inhale. Traditional chronic obstructive pulmonary disease treatments include several medications that help relax the airway muscles to improve breathing, things like bronchodilators and anticholinergics. Corticosteroids are sometimes used to reduce inflammation of the airways. Some patients require additional oxygen. In extreme cases surgery is performed to remove damaged sections of the lungs as treatment for chronic pulmonary disease.